At long last, the `Ainapo Trail story in pictures and words! Huzzah, and here we go. The day started early and 5 of us headed up Mauna Loa’s northwest flank in my boss’ heavy duty truck. Once we were near the summit, the helicopter met us and flew us across the caldera to the southeastern flank. My boss was already waiting for us, as the helicopter had taken him up first. We split into teams of 3 to perform our surveys. My group headed down the `Ainapo Trail, certain to camp overnight. 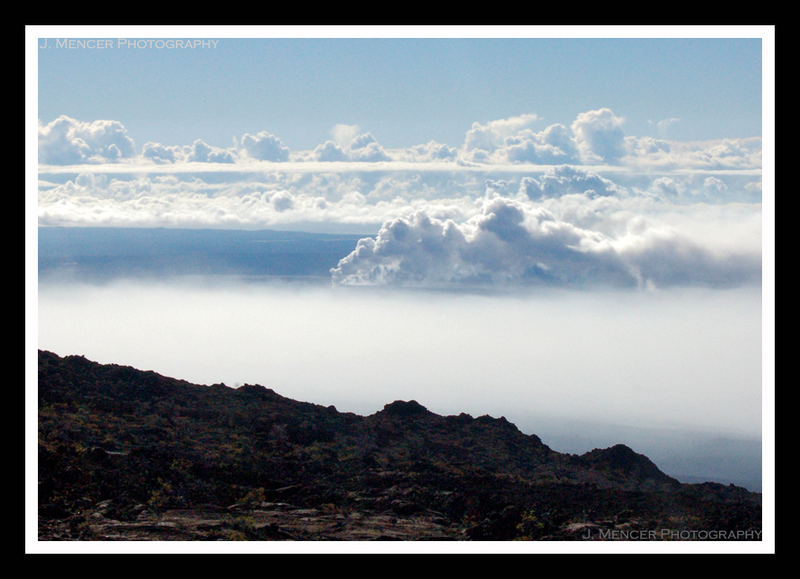 The second group headed around Mokuaweoweo (Mauna Loa’s caldera) and was able to drive back down the same day. Here’s the start of our survey. We were at the 3rd benchmark here, and we were just finishing up lunch. The day started off beautifully. The good weather was not to remain our companion for long, however. This was the scene near our 5th or 6th benchmark. I have to say that I love my boss’ outfit. Like all good geologists, his style is impeccable. You’ve seen the way I dress in the field, so be aware that this is utterly tongue-in-cheek. Perhaps we should look into Nike sponsorship or something. At least then we’d match. The fog was accompanied by rain, and we found our last benchmark of the day in a steady drizzle. Luckily for us, the bossman is resourceful and found a dry (albeit cramped) place to sleep for the night. In a lava tube. On the side of the world’s largest volcano. This has to be one of the highlights of my outdoor life, if not of my entire life. My boss did a lovely job of modelling the tube for the camera. We had a simple dinner of minestrone heated over the tiny stove, and then we were about ready for sleep. Camping conversations are always fun, and ours was no exception. I’m not going to post a photo of my portion of the lava tube, as it was an even tighter fit than the one pictured. My parents do not need their respective blood pressures elevated any higher than necessary by my escapades. I do have to say that one of the most rewarding parts of camping is the unexpected splendor of the early morning views that are often available. When you reach a campsite at night, the daylight can offer wonderful surprises. Shortly after dawn on Mauna Loa was no exception. The plume from Kilauea’s Halema`uma`u vent is visible in the middle of the picture. It is situated at approximately 4,000 feet above sea level. Our campsite was about 9,000 feet above sea level. We started our hike around 13,000 feet above sea level. 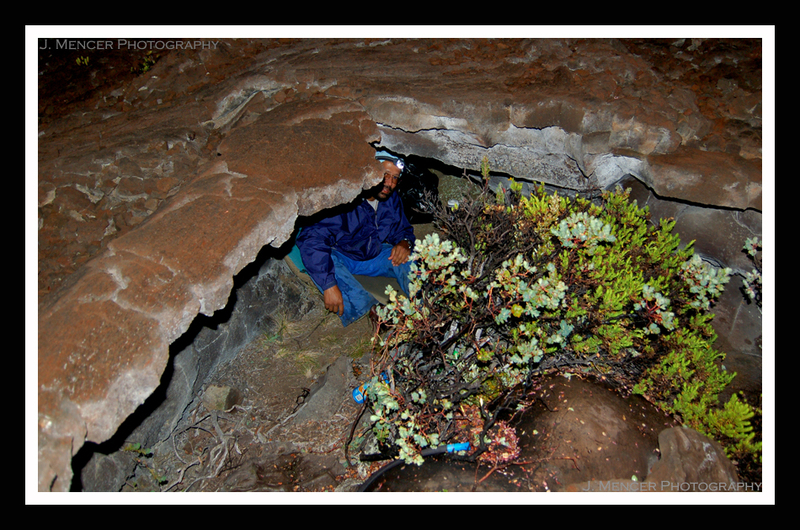 The temperature dropped to 42 degrees Farenheit in our lava tube, so we weren’t that uncomfortable. I slept poorly, but that could have been because my tube section was the size of a coffin. Most of the hike was over a`a lava, and that’s why I was so battered by the end. The survey went well overall, and we’ll polish the data tomorrow. We should be able to compare this information with last year’s in order to assess Mauna Loa’s deformation rate. 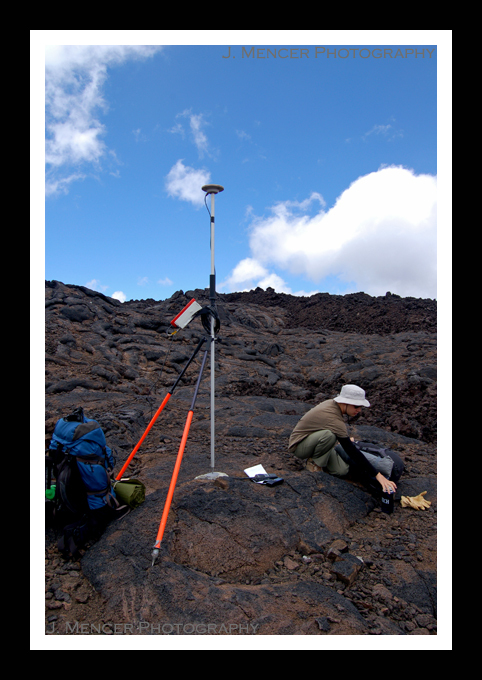 This, in turn, will enable us to form a better picture of the volcanic activity beneath the mountain’s massive surface. I spent yesterday in the office sorting and cataloguing last week’s Cl-36 samples for X-ray fluorescence (XRF) analysis. It was a quiet and non-eventful day, so that’s why I didn’t write a new post. Today I was supposed to go to the floor of Kilauea’s caldera and learn how to do kinematic (moving) Global Positioning System (GPS) surveys. Unfortunately, that didn’t happen due to a timing error when it came to dodging red tape. 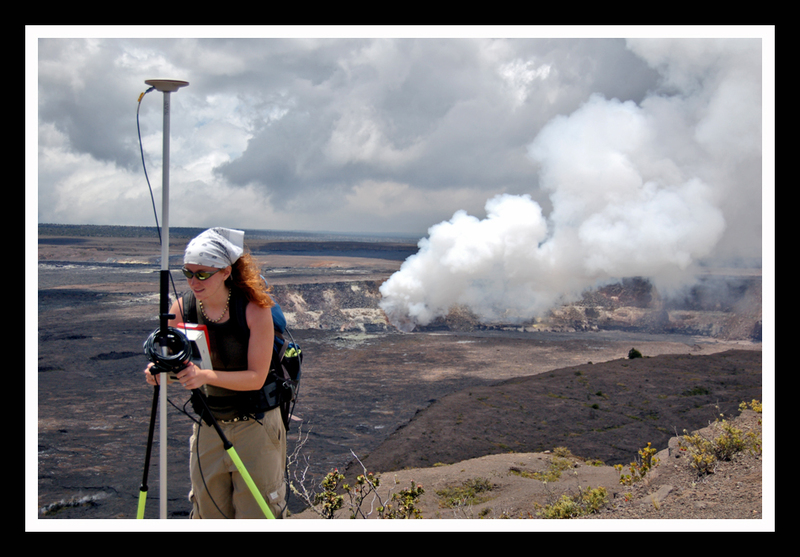 In order to go into Kilauea’s caldera, you have to wear a respirator and hard hat. This is due to the extremely high level of sulfur dioxide (SO2) gas that is issuing from the newest vent, Halema`uma`u. Because of the likelihood of lung damage from SO2 inhalation, the government requires that all new caldera researchers take a spirometer test. A record of your original, pre-caldera lung capacity is needed to compare against any possible future lung damage. I couldn’t get an appointment to visit the doctor in Hilo until Friday, so today’s caldera trip was cancelled. The kinematic GPS (kGPS) tutorial was not, however. We visited several benchmarks outside of the caldera rim for training purposes. Here’s a geodetic survey benchmark, so you understand what we were looking for. These markers are small metal disks affixed firmly to the ground and their precise locations have been recorded before, sometimes many years ago. 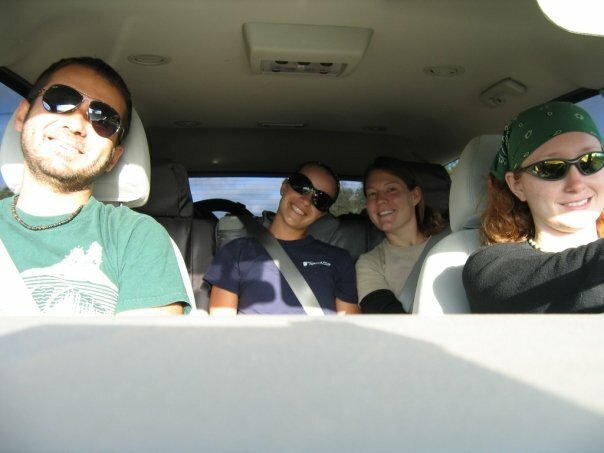 People who are into geocaching may be familiar with them already. 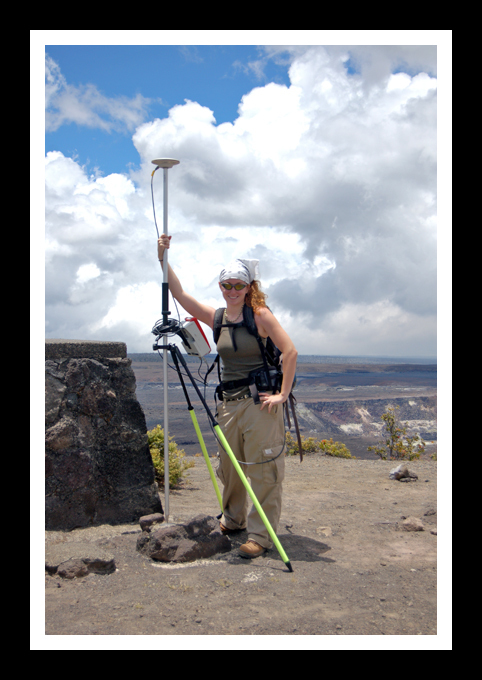 I required kGPS training because on Thursday I’m going to be part of a team that is being dropped off by helicopter on the eastern flank of Mauna Loa. 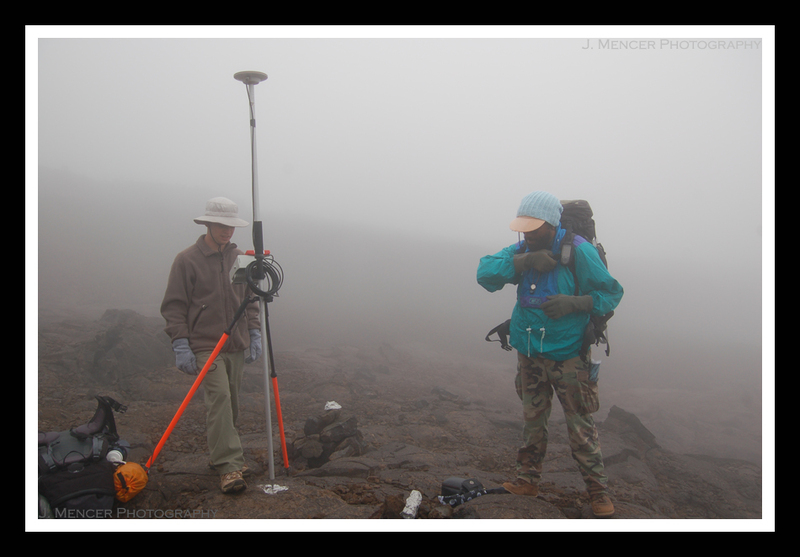 Our mission is to hike down the `Ainapo Trail and record the benchmarks on the Mauna Loa level line. This will allow us to see if the volcano is deforming at all. Deformation can be a good indicator of volcanic activity beneath the earth’s surface. At any rate, the `Ainapo Trail is widely regarded as the most difficult hike in Hawai’i. Let’s just say that I’m pleased we’re carrying the equipment down and not up. We’ll be camping out somewhere on the trail on Thursday night, and we should return on Friday. For now, here’s a picture of me with my kGPS from earlier today. That’s the summit of Kilauea, the world’s most active volcano. I suppose I ought to mention that there was an active volcanic eruption occurring behind me.